Work for iCIMS Talent Acquisition Platform? Learning about iCIMS Talent Acquisition Platform? "Very Robust Applicant Tracking System"
"Improvements all the time but still not really listening to their customers"
Lots of configuration options and the ability to customize including creating custom fields. Report dashboards are nice. I can write reports then share them with a login group. Support is pretty responsive, usually get a non-automated reply in 24 hours and support is very knowledgeable. Onboarding tasks can't be reassigned to a different HR Coordinator which can be challenging when someone leaves. Test environment is very limited - can't test candidate or onboarding features as the test system only is the "platform" and does not include the portal. HUGE price hike after our 3 year contract was up (76%!) even though we had a percent max at renewal listed in the contract, they did not honor it. Moving from a person profile to a recruiter workflow profile can be confusing for new users. Although the product is improving, the huge 77% price hike made us really question our choice. Recruiters like it for job postings but managing tasks aren't quite where we need them. Posting a job is fairly easy as is managing aprpovals. "Recruiting Information at your fingertips"
When I joined the company I am with currently, there was a proprietary ATS, which means it was not a real ATS, so I started the search to bring in an ATS solution for our recruiting needs. We looked at 6 different products and decided on ICIMS for a few reasons, the main reason being the UI (user interface) was easy to navigate. All the information we needed was right there and we can customize our screen to see what we want, where we want it. The reporting is great too, as it provides all the information you need to provide stats back to management. Lastly, their help desk is really helpful. Very responsive and quick to answer questions. Really happy with our decision! More of a wish than a dislike, I wish that the background check vendor we work with was integrated with ICIMS, currently it is not, but not a deal killer. Be sure to look at other software products to make sure this does meet your needs. It is always interesting to see how different ATS systems are set up to do basically the same thing! 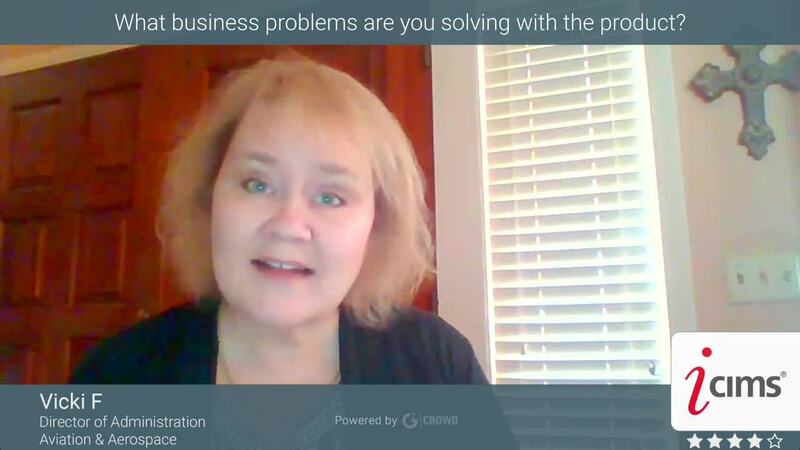 The business problems we are trying to solve is getting resources in quick enough. By having ICIMS we are able to provide data to the business on how many resumes we are getting, where are they coming from, and if there is a breakdown in the process internally we can show that through the reporting. "Customizable and Easy To Use"
The system has a great customer support line/ticketing system. Almost all of my questions or system updates can be answered over the phone. If not, they are prompt in putting in a ticket for their technical team and I receive a quick response back. The platform itself is also easy to learn and utilize, along with having opportunities to customize the system to work best for your team. There are some system issues that hold the platform back. For instance, most emails that are sent from icims by a recruiter/hr seem to go into the spam/junk folders for candidates. The system allows for easy access into the life cycle of the candidate, from applying to a position, interviewing, accepting, completing paperwork, and starting. The system also helps us to record and track key metrics that we can bring back to our business partners. iCIMS is a great tool of any talent acquisition team. I have used this tool to source, recruit, and hire candidates for specific positions within a previous company. This tool was always fast working and gave you everything that you could possibly need within a recruiting tool. It had many features to send emails to candidates, source candidates in a quick and timely manner, and helped to organize your requisitions as well. It was a great tool to set up different workflows that were needed and to manage the metrics and analytics that were needed by the company. I would highly recommend it to any TA team who is needing a great application tracking system to help them recruit. iCIMS was a tool that helped our company and team in many different ways. There was never a time that iCIMS could not preform a function that we were asking it to do. It helped us to source, recruit, and hire the talent pool that we were ultimately looking for. It helped our company to add requisitions and be able to post them out to our company website and to other sites that were integrated with iCIMS. iCIMS is a fantastic recruiting tool that everyone needs to have. We used iCIMS to hire for all of our core positions around the nation. We used iCIMS to help us recruit the right talent community and used the tool to source through resumes. This was actually my first time playing with software like this. We have a large client that staffs about 500+ employees, and they're looking for newer and better ways to streamline their hiring process, and to get new employees up to speed quickly. So, what's not to like about software that transitions new hires through a personalized, immersive experience that automates the whole hiring process? I would highly recommend trying the software yourself, just to get an idea of what the user experience would be. Understand that the resume population isn't perfect and it's still going to require the human element to review everything and make sure it fits. The last thing you want is a candidate to be passed up or their accomodations/achievements to be overlooked by a bug in the software or misplaced information. Our client has been able to streamline their hiring process and get new employees up to speed without having to waste a ton of time with HR, significant amounts of training, etc. New recruits are brought in fresh and ready to go, having worked with the software before even their first day. I like that as an administrator, I have access to what I need and what I can see. And, I can also view thru a hiring manager's view, to assist them with any issues they may run into. It collects the important metrics that we use in planning. We can pull data to see trends in hiring practices, seasonal anomalies, turnover. We can also pull demographic info. It is so easy to use and there are multiple ways to perform each task. So, a user can really cater it to fit his or her work style. The training videos are way too long, and they skip from one topic, to another, then back. The training modules on using the software should be simplified and made easier to follow. I also don't like the bugs we have encountered, like with automatic emails when pushing a candidate thru. We update info on our end. Then, those informational emails should go to the designated hiring managers. We have had some issues with these. However, we contact our support and issues are taken care of expeditiously. We are able to streamline our recruiting and onboarding processes. We are able to get rid of paper apps, and reduce the amount of actual paperwork to be processed and filled. We're saving money because of the efficiency. We are also able to pull data which will in turn help us be more efficient and successful in reaching goals of the organization. Having to go into each Req to add myself as the recruiter. I could see it working well when building the reqs, most people know who the recruiter is going to be at the beginning, but when you have to change it, it does become tedious. It has more benefits then drawbacks. Evaluate what the actual needs of your company are and look into if this is a good fit. High volume recruiting for entry-level positions. We get many applicants for the ever green reqs and it is a wonderful way to organize them. Not having good applicants fall through the cracks due to disorganization. Accountability of being able to see who has made the changes in each section. "A must have software suite for easy recruitment"
I really like Ari, which is an AI-driven tech (like Siri or Alexa), and it has been very helpful in recruitment of candidates for my company as well as streamlining the interview process. The functionality of TextHR. We had tried to use TextHR to communicate within the employees of the company, but the app was not particularly intuitive in terms of its layout, and we switched to Slack instead. I think the most counter-intuitive aspect of TextHR was the (lack of) organizational tabs; comparing that to slack, all the users are easily searchable and reaching out them is as easy as messaging them on iMessage or a similar platform. In contrast, TextHR did not have as easy a layout and felt much more "formal". It's very user-friendly and Ari (their AI-powered tech) is amazing. Definitely worth a try to see if It meets your company's needs. We tried TextRecruit for streaming the hiring of new employees. We realized that some of its features like Ari and TextApply were quite useful in scheduling interviews, getting the word out about our jobs and increasing the number of applications we receive. "Not the Worst Experience, but Service is Frustrating"
There is A LOT of customization that, in theory, can be done in the Dashboard. Our Integration person has been a bit of a nightmare. He's not an effective communicator (a lot of loud sighs, "we'll get to that" and repeat interruptions to change course when he doesn't know an answer to something) and in reference to the customization, has done everything except flat out refuse to make them. It's been really frustrating because it's what we were sold on and what we genuinely need. If you're not getting what you need during integration, speak up early and often. We wish we'd asked for a new integration manager early on, but we were too far into the process when we realized we'd have to do more heavy lifting than we had been told to expect. Again, in theory, we're solving a lot of issues that we've had with tracking properly, but it's proving to be a bit of smoke and mirrors on the sales person's part. The mobile optimization for both candidate and recruiter is helpful, as well as 3rd party software integration that save us time overall. "Great software for all your recruiting/hiring process"
iCIMS saves us a lot of time with its recruiting procedures. Stuff that was done using paper sheets, online forms and slow process, can now be done in one, single software. It is also very integrated with excel, which allows the user to pull reports directly from it. It can be tough with users that are non-HR, and not familiar with how to properly use the software. It also lacks some functionalities, but nothing that affects the experience very much. We have increased our productivity and hire ratio exponentially. The time saved with iCIMS is being used in different projects, which helps the team a lot. Also, out staff finds it to be quicker than other software. Creating job postings is a breeze. The foldering and bucketing systems in the job requisition makes it easy for recruiters to track their candidates status. The dashboards are customizable with different graphs or information about positions. Their support team is great, there is tons of information on their website and their support line is helpful as well. The user interface itself is very bland. It could be spruced up a little bit to be more enjoyable to look at. Utilize iCIMS support whenever you need it. They provide a very inclusive online database for pretty much anything you would need. If you can't find it, someone is always willing to help! The candidate experience has improved vastly. Also, our hiring managers have found it much easier to submit their job openings to the recruiting team. "Helps keep things together and trackable"
I can find and track everything I need to for all the hiring I do here without consulting my HR contact for much. It's also part of my G Suite apps, so it's convenient to find and login. The dashboard is quite busy, so navigating to exactly what I'm looking for can be a chore (but this might have more to do with how our org has laid it out by default than the software itself). I'd also like more of the interview scheduling, as well as linking to where a req is publicly posted to be readily available as part of a res entry in the tool. As a hiring manager, I need to be able to create and update reqs easily, then track candidates and approvals, which this allows me to do. I no longer t need to operate in email with (various) HR contacts in order to keep it all straight. I like the product design of the three major components and how they support the candidate pipeline. Evaluate your current tools and processes and make the appropriate design changes based on your outcomes and needs. Then select the tool that will get you there. We have a small high performance Talent Acquisition Team and we are highly productive in a very fast paced environment. We save time and are very efficient throughout the candidate development lifecycle. We have gone almost paperless with onboarding and have had great success. What I like best about iCIMS is how easy the platform is to navigate for both our HR team and for our hiring managers throughout the organization. Additionally, they are always pushing through new updates (free) that help make the system better and their customer support team is outstanding. If I have to say what I don't like about iCIMS, it would be that they only focus on being an applicant tracking system. Our organization enjoys them so much that we wish they would release other platforms as well. One of the best vendors to work with - they are honest, supportive, fair, and very friendly. For my organization, we were able to move from a paper and pencil application to having everything online including our entire on-boarding process.The ROI for us was almost immediate with all of the time we were saving. From Hiring Manager perspective: The ease of looking at resumes and downloading one document that has all resumes combined. I also like the professional look at feel of the job posting and ease of sharing the job posting. I love the feature that emails all the applicants when a person has been hired and the job is filled. From Applicant perspective: I like that you create an account and can apply for different jobs within the company, but your basic information is saved. I like the ease of uploading cover letter and resume. It's difficult to find where the additional documents are after the resume. I often have trouble finding cover letters. Sorting and managing the hiring process with many candidates. Notifying candidates that the position is filled is a huge time saver. "Amazing ATS with Great Reporting Features"
I like that is so easy to find a candidate or a requisition in the system. I can edit information easily and view reports and notes from hiring managers that allow me to ensure compliance. It may be very user-friendly, however, the look of it is not very aesthetically pleasing. I urge you to look into the product. There might be other platforms out there that will fit your needs if you are a smaller company. However, if you have a larger corporation or business, definitely consider iCIMS for your hiring needs. It will aid you to create a great experience for users, hiring managers, and most importantly the applicants. We are able to track our candidates easily and note why they were hired or regretted in case of audits, etc. "Organized, helpful and easy to use tool that provides what Recruiters need to do their job well." Overall the dashboard is the right tool within the product; the customization that can be done based on role is perfect. The overall system is very user friendly and the candidate and job views show the right information in a nice 3 panel view. Additionally the ability to change the view for your companies customization is flexible to use, so this is really a nice ability most systems don't have. I honestly can't say there is anything I dislike about iCIMS at this point. Everything has been working great and great customer service. The dashboard is a great tool and it was something I highly value. The scaleability and flexible customization for your needs as a recruiter and a company are perfect and easy to implement. Candidate management within iCIMS Recruit is easy to use with great automation functions that work with your process. We are able to increase our efficiency filling positions that include time to fill, increased exposure, and create a positive recruiting experience with our candidates. Recruit has been able to help us with a streamlined process for our hiring mangers to follow. We can't wait for us to roll out their manger view for more efficient for them. We have not rolled out out as we have multiple system roll outs in the last year we wan to make sure they can adapt to this. "A great ATS - especially for Onboarding"
I like the seamless transition from Recruit to Onboard. The software is user friendly and is very interactive. So many things can be accomplished within the system. There is no need for manual forms to be sent through email. This means that almost every aspect of the recruitment process can be included in metric reports. I dislike the lack of control a system admin has. It seems as though so many small tasks have to be completed by support. Also, we have to use iForms for offer letters, which can be very expensive. Onboard is a must. We have employees in different states and countries - the Onboard product simplifies the management of all the legal requirements for different locations. There have been many benefits to using iCIMS Recruit. The application process is simple for our candidates, and the system is easy to navigate for our recruiters. I like that for a candidate, the portal is the same for application and onboarding purposes. We no longer need any paper forms when bringing in new talent. "An easy ATS solution just right for our Small Biz needs"
We have just begun using the ICIMS and so far so good. The candidate interface is seamless and the admin controls are intuitive. The training I received and demo seemed just about right and although I have needed some follow-up with a rep, they are pretty accessible. Have not used support as of yet and they did negotiate a bit on price which was very helpful as we are still in start-up mode. Once we scale up, Im hoping the system will keep up. So far have not had any major issues. Maybe the only 'inconvenience' is the importing of candidates from our old system. There is an email address where you attach resumes to, and candidates are automatically imported and created in the iCIMS platform (this is a nice feature of course) but it is limited to 10 attachments per email. We did not have thousands of resumes - but if we did...that would be a problem. Integrating sourcing, recruiting and on-boarding while creating a seamless end-user experience. Integrating into our current benefits and payroll system. "Flexible Platform, Streamlining Our Hiring & Increasing Effeciences"
I like the flexibility of iCIMs to accommodate a variety of complex hiring processes. As we've added, changed and grown our processes, iCIMs has been able to grow right alongside us. They are constantly evolving and advancing their products - which is very refreshing. There are a variety of configurations that an ICIMs Support Technician must make on your request. There are sometimes I wish we had more control - but a call or email ticket and I'm reminded they have some of the best support I've experienced. Instead of wanting more control, it's nice to have a team of experts waiting to help. You should have someone on your team who is well versed in technology. We formed a partnership with HR and Technology inside our organization. This was a win. The administration is technical and will require quite a bit of technical understanding. This shouldn't scare you. The training, support and implementation process is very user-friendly. Just a note that this is a technical product. iCIMs will dramatically reduce our current paper-driven hiring process. In addition, our Hiring Managers will have a real-time view on where a candidate is in the process. We are saving countless emails and phone calls and hours of back-and-forth for virtually everyone involved in the hiring process. "User-friendly ATS with awesome customizable capabilities"
I love the sleek and minimalist design, the fact that you can search anything and return a result easily, and the interface is very user-friendly. You can also customize your recruitment process to be what fits your company's needs, which is very helpful. My company does not use everything iCIMS has to offer, but it would be great in the future to apply iCIMS's capabilities to our recruitment processes. They have a ton of iCIMS Webinars to learn how to best utilize their products and services. This is sort of a double-edged sword. They update quite frequently. While I easily adjust, some people in the office dislike the changes that are made at times. However, improvements and changes are necessary for growth. The only other dislike is the scheduling system. It is the only component to the ATS that is not as user-friendly as it should be. If you're looking for a product that has great customer support, is user-friendly and is customizable to your needs, this would be a great choice for you! We used to be an all-paper recruitment process. iCIMS has completely streamlined the recruitment process, allowing us to have time-savings in regards to less paper. Everything is all in one place, which is a huge benefit. In addition, reports can be ran on almost any aspect/detail in iCIMS, which makes it great for the analysis of the data and determining if there are improvements to be made in certain areas of recruitment (i.e., advertisement). Since we are fairly new to this whole transition, I think the benefits are huge and it makes our lives as recruiters much easier and less easy to have human-error. "iCIMS has greatly improved my productivity and ability to communicate with hiring mangers!" The ability to share candidates with hiring managers, communicate with candidates, get approval for offers and keep all the details electronically in one place. I can't think of anything. I liked the recruit product so much less than a year later I got approval to add the onboarding product. It has been wonderful! I would defiantly switch again. Take a look it is worth the money and the time to get your process just the way you want it!! We are getting better candidates. I have been able to take the process from emailing candidates back and forth to managers to forwarding them directly to hiring managers. Then when they are ready to make and offer I go directly through the system for the offer approval process, the offer, background & drug testing, moving directly to onboarding. It keeps everything all in one place. It is very organized and efficient! This doesn't even mention approval of new jobs, posting, getting them on our internal & external job boards. We also post them to regular job boards and niche job sites through iCIMS. It has been such a wonderful tool!! The iCIMS interface is my favourite thing about the tool! and the People at iCIMS come a close second. It can be frustrating at times to work through the helpdesk - not because of the Helpdesk Agents but because there can be a delay in response times due to my location in the Middle East. I also find the configuration portal a little confusing but it's one of those things that the more you work with it the easier it becomes. Be sure that you have a team who is technically savy and are curious enough to explore the tool themselves as you don't get much spoon feeding from iCIMS. Good idea to have an iCIMS trainer come out and train up the team before the system goes live as no amount of online training can truly prepare you - a day spent working through lots of examples of how the system will work in your environment gives your team an added advantage of having a successful launch. Effective tracking stands out, information at my fingertips is another (I oversee recruitment operations so it's awesome to be able to keep track of my Team's performance and productivity); great candidates getting access to our career page and this is impacting our recruitment costs positively. "Customer Service Has Been Great, some functionality hiccups"
Coming from never having an ATS its been pretty great in terms of being able to customize most of the processes and work flow to match what I was used to. I'm still very new so haven't dove into the reporting tools yet. I really like being able to easily email candidates and the templates are all stored. There are a lot more tactical actions and clicking around than I would prefer. To get from a persons profile to their candidate profile is time consuming. We've yet to fix problems with Social Distribution so I haven't been able to release it to the org yet. Its a very robust system and a little hard to remember where to go to make changes. If a manager asks a question in the offer approval process and declines approval, the data is lost after and you have to restart the approval process all over again. I still can't understand why the offer can't track or house the questions/legacy information within notes somewhere. Would be great to have other documents easily visible as an image like the resume. Managers have complained they have to download any additional documents to view them. Tractability, ROI, time management. Candidate engagement is key. Would love to learn more about recruiting marketing campaigns to keep candidates engaged, just haven't had the time yet. "Still learning the ropes, all good so far!" I am still learning how to navigate the system. My experience so far has been good, it is organized in a fashion that is easy for me to learn and utilize. Most of the issues I have run into have been addressed by our support team. The only problem I do see is when I get an email notification of someone applying to a position, it does not tell me what the location is they applied to. I am pretty sure it is how we have posted the job. This is a neatly organized system and easily utilized by all members of our HR and Recruiting for access to our candidates as they go through the hiring process. "Meet Expectations, Continues to Improve. " Constant improvements to the system being made. Easy to interface with other systems. Extensive help desk, forums, community for everyone to participate in. Never feel unsupported. User interfaces, searches, and other aspects currently being updated and re-looked at which is making it easier for users to learn the system and how to use. Some features can be difficult for all users to learn to use at first. Some features are missing aspects you would expect to find in similar products. Used for tracking on data that we are audited for and for records retention. Able to pull metrics for recruiting performance and business performance. Streamlined many manual processes through the platform to ether make automated or semi-automated, creating more time to spend on important tasks. Creating a more thorough integration with internal HR. Helped close the gap on time-to-fill to create a more seamless and automated system. "Great applicant tracking system "
What I like most about iCIMS is that their client service is by far some of the best I have ever encountered with a vendor. Anytime you need help their client support line is always available to help out and I have not had to wait longer than 5 minutes or so for an answer over the phone. Additionally, when you open a ticket with them on an issue you are having, they send you email correspondences for every update they have to share, which I appreciate because you are always in the know on how to move forward with issues you are having. What I like least about iCIMS is that their focus is mainly as an applicant tracking system and not a full-service system that includes features like payroll, performance management, succession planning, etc. iCIMS has really mastered being a very reliable applicant tracking system, but they have room to improve moving forward as a full-service provider for companies. ICims is a really easy recruitment platform to work with. You can create various job postings and they all go to a central "box" for each job and you can then sort through them even more after that. It's all easy to teach and learn even to co-workers outside of HR. You do need to stay on top of their updates to make sure you're getting all the newest features. I wish there was a way to just delete applications out. You can only sort them into a reject/turn down bucket but eventually those buckets get full. They have old rejected applications from years ago. I just want to delete them out permanently. Mainly meeting recruitment goals. ICims keeps it all nicely sorted and notifies us of certain new apps. It's also helping us see what postings are getting the highest applications. The system is incredibly intuitive and easy to use and configure. I love being able to schedule and do offers directly from the ATS and have it integrated with our company calendar. I'm a recruiter; too many clicks for certain things but that's the case with any ATS! Take full advantage of your implementation person. Matt Girard was amazing and we did our implementation in record time! iCIMS Recruit has given us the ability to streamline the offer process and improve candidate care. "Easy to Implement With The Right Resources, Intuitive to Use as a Recruiter"
This is my 2nd implementation with iCIMS, and I have used the Recruit and Onboarding portals, HRIS integration, bi-directional data feeds to a background vendor, and Agency and Hiring Manager portals. I have also worked on the back end of other HR systems, such as Taleo, PeopleSoft, ADP and SuccessFactors. Comparatively, getting iCIMS up and running and working on the back end is MUCH easier than any of these other systems. Along with that, the iCIMS support and project resources are phenomenal, highly responsive and will go above and beyond to make the system work for your process. From a systems admin, or recruiter standpoint, the iCIMS online training is incredible and it provides an excellent foundation of the system. With a little bit of internal training and explanation on the company's specific setup, and the intuitiveness of the system itself, people get up to speed very quickly. This is not as much of a dislike for iCIMS, as it is a recommendation to be ready to assign the right resources internally. iCIMS quotes project time expectations, not taking into account who the company has assigned to the project or their experience level, which places unrealistic expectations on the project manager and implementation timeline. Also, iCIMS sells the system as "super easy" to configure, which it is, but without clearly defining the internal resources needed, signoff, testing and adjustment requirements, people who are not knowledgeable about systems implementations start asking "can't we just turn it on"? LOL, no. One thing iCIMS could do is to outline a real number of hours and duration required of tasks and testing, and provide best practices and recommendations up from for what types of internal company resources are recommended for implementations. Make sure you have experienced, dedicated, resources to get the system up and running, even if it means pulling them off everything else for a few weeks. That, or hire a contractor with this type of experience. Also, ensure your HRIS system data is streamlined to only what is necessary to create a new hire record, and that your data and fields in the HRIS system is "clean". Here's the difference in having the right resources and HRIS systems alignment. At the first company, our HR team were specialists, dedicated to an area of expertise, and we had a very strong and responsive IT team. At the time, the iCIMS implementation was my main focus, and I was assigned an IT and HRIS resource, both with prior implementation experience. We also had several recruiters involved in testing and a dedicated, full-time, iCIMS Administrator. Due to this level of knowledge and support, we had all implementation work completed in less time than the iCIMS estimates. 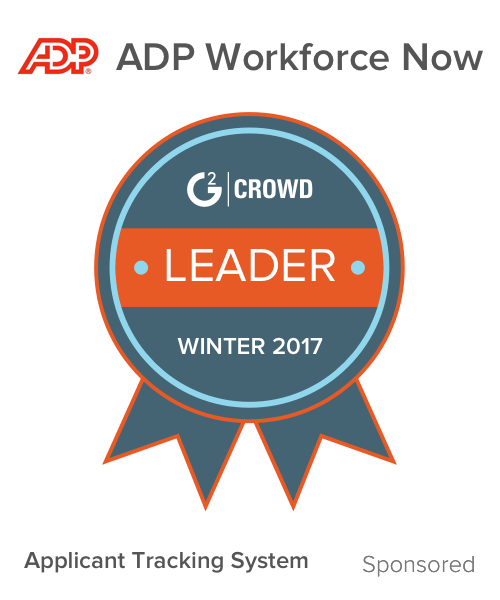 With regards to the HRIS integration specifically, we had ADP, and a very knowledgeable, prior IT Director, as our HRIS Director, who had taken the time to clean-up our ADP data, prior to the integration, so it made the mapping and testing process seamless. At the second company, we operate more as a decentralized "generalist" model, and this is a very small part of my daily job. I get pulled away from the project frequently for other priorities. Also, none of our HR resources are familiar with iCIMS, or systems implementations and back-end configurations in general. My project resources have been reassigned several times as well, or left in the middle of a project. Currently, I have two part-time HR resources, with non-overlapping schedules, who are also limited on the amount of hours they can contribute and have many other priorities as well. They are both smart, quick, learners, and are very helpful and supportive, but things move very slow since we cannot get connected or have limited testing time and too many days between meetings. We also have no one from IT aligned. With regards to the HRIS integration specifically, our ADP system is set-up with multiple company codes, due to acquisitions which have not been fully integrated and have separate time and attendance systems and benefits plans, along with a lot of "required" fields, which means we have had to add a ton of fields to iCIMS, and the recruiters will have to manually assign unique position numbers in iCIMS to ensure the feed is mapped correctly. We will streamline the new hire keying process some with the HRIS integration, but certainly not as much as we could have if we had integrated acquisitions into our systems and benefits from day one, and had not assigned them to multiple company codes. At both companies, we implemented iCIMS to convert from entirely manually, cumbersome steps in the recruiting, hiring and onboarding process. The intent was to make our HR resources more strategic and efficient in their daily work, and to streamline the time it takes to recruit, hire and onboard a new hire. Moving to this system certainly accomplishes all of those benefits. iCIMS was one of the most innovative software's used inside my organization. The HR department housed the recruiting department, which used iCIMS for all stages of the recruiting process. I like that the system allowed users from the recruiter to the President to sign and continue the recruiting process all in one system . I disliked the lack of reports the system could generate for users. I would like to see updated data analytic functions for the system. Overcoming technological barriers faced when using multiple HR software. We just a competitor for HR functions however using recruiting functions in the competitors product produced errors consistently, causing delays in the recruiting process. You get what you pay for with iCIMS. We knew that it wasn't a system that we would outgrow and with their reputation of a top quality Help Desk, it was a no brainier for a partnership. There has never been a time that I have felt like iCIMS support didn't have my back, and they offer so much information to report from. It can be a bit overwhelming when starting from scratch. Definitely recommend the system. But start small when implementing. It's capable of so much, but easier to add then to take away. We are solving our issue of Onboarding company wide. We can't wait to get through implementation for that part of the platform. iCIMS solved our recruiting issues by keeping all our applications and candidates in a centralized location. "Good, simple interface with options for customization. " Integrates well with our platform. Training on how to use is simple most of the functions are straightforward and easy to grasp quickly just by scanning the page. Some options only work on mass selection and some that should work on mass selection don't. I hate to have to individually go though and do certain dispositions that I should be able to do enmasse. Before we used iCIMS changing things like our job descriptions or titles would have to be changed individually for each job title at each location. Not a huge problem if you're dealing with one store but become a bigger problem as you expand to have more and more locations. Powerful system! We use the social distribution tool, the career page, and applicant tracking. ALl systems work great. Though they work great, it takes many "clicks" through each system to get anything accomplished. The systems have a steep learning curve. Great system. Like any applicant tracking system, if you implement it correctly and use it consistently, you'll make your life easier. If you're lax about keeping your documentation accurate/up-to-date, it's easy to snowball and make information management harder. We love the social distribution tool - It lets staff auto-post via their social media networks whenever we have new roles open. The other systems do what they need to - but this is the tool that allows other teams in our company to realize how great iCims is. "Best ATS in the Game"
I love the customization of iCIMS. They keep on top of best practices and are continually developing new ways to integrate newer technologies. I've recently attended a collaborative workshop in Philadelphia that iCIMS hosted for current and prospective users. They don't just stop with an ATS; they go above and beyond to grow their system is ways that users need and continue to educate their users on ways to get the most out of the system. Generating custom reports can be very time consuming and difficult. The freedom to customize everything can lead to a lot of frustrations if you're having trouble locating the filters or functions you need. Once you are able to figure it out though, you can run a report and filter just about anything you can think of. Do it. You will not be sorry. Sourcing and tracking a candidate's application and multi-step interview process. Online paperwork for new hires through the Onboarding feature. Length of employment with our company. Length of time to fill a req. Improving quality of candidates that we're interviewing. "Best in Class Recruiting Software"
It has significantly increased our candidate pool because this system will still capture candidate information even if they abandon the process before they hit submit. Many other ATS do no have that capability. iCIMS does need to have reports that arr a combination or job profiles and person profiles. For example, I can run a report on time to fill for the company, for locations, for job titles, for job grades, etc. However, I cannot run a report on a hiring manager's average time to fill. A metric like this could be really helpful for workforce planning with new and future requisitions. Make sure you have all of the potential recruiters in on the implementation process, instead of just one leader. We have lowered our Time to Fill across the company from 81 Days to currently 57 Days. This has been a huge accomplishment, and can really speak to the value of having a very clear communication strategy that iCIMS can help with. "Big fan of iCIMS and their Connect application"
The Connect applications that has Talent Pools and Email Campaign functionality. Most ATS do not allow you act like a CRM but iCIMS allows for this. The secret to building a large database is to being able to find your data. The tagging tool inside of iCIMS allows users to do this and there is the ability to bulk edit data in mass also that is crucial to database management. I would like to be able to report on more data. I would like the portal functionality to be a little bit more customizable. If you want to do outbound recruiting and manage long-term relationships with candidates, iCIMS is for you. Talent pooling and outbound engagement. Being able to build and manage long term relationships. "Great tool to assist in the busy world of HR!" The streamlining of our onboarding processes. The time cut from having to have new employees fill out their new paper work their first day to doing everything online before their start date has helped tremendously! The reporting feature is also a great way for us to track metrics that we weren't able to before. There are so many features that is hard to learn them all! This is definitely a tool that is worth every penny. However, it is imperative you attend all the meetings and trainings prior as when you go live, there are so many things you need to know! The recorded trainings are very helpful if you are unsure on how to do something and support is always available! We are putting multiple processes into one system so it is easier to keep track, especially when we are hiring so many new people at this time. We are able to complete almost aspect of the recruiting and onboarding process through the system so it cuts out all of the separate excel sheets and check lists that I had to use before! Good way to keep your applicant processing organized and give line of sight to others. Ease of managing job postings. Implementation took a while, long process. Team needed a great deal of training to be able to use to its potential. Not as much customization as I would like. Will give great line of sight to recruiting process, gives a place for all information needed. Great tool to use in reporting to other departments. Make sure users are well trained, will make implementation much easier and you will increase your ROI. Making tracking applicants and onboarding much quicker. Easier reporting for recruiters to report on status of pipeline. We had a large talent pool to manage and track iCIMS made that much easier and with better reporting functionality. "Mankind's Reach Now Equals It's Grasp!" The dashboard and system functionality has been tested and reconfigured to make sending out campaigns, reaching out to individual candidates, and even using AI in your recruiting process extremely streamlined and easy. When tracking responses and candidates available for the month, the page is required to be reloaded. Although not a huge issue, an update in realtime would go a long way. For example, when staying on the page you can't just monitor what's happening because, 1) You'll logout after a period of inactivity and 2) Reloading the page can cause some issues with signing out and in. When making campaign lists in .csv format, you only need to have the First Name, Last Name, and Phone Number. The other information, even though it has a label, isn't important so don't stress out about it. Reaching out to a mass amount of candidates and a very little amount of time. It saves both time and energy by allowing you to take a call list of over thousands of candidates and not only lets you send out mass messages to them but also validate the phone numbers for you. It won't send messages to numbers that are registered to landlines or lines that aren't active anymore. Also, if you choose to go with their AI response system called "Ari", you can attach her to your messages that take the conversation one step further and gathers the "phone screen" questions of your choice so you don't have to spend time asking them anyway. Using TextApply as well, really the only activities you need to do now is pure Sourcing and Recruiting. The iCIMS interface is the weakest part of the software. I dislike the feel of the software and sometimes it can be difficult to navigate, change and/or edit existing requisition that are opened. This is not a huge thing but the only part I dislike. The main benefit has been the efficiency in getting requisitions approved and reviewed throughout the organisation. The great advantage is that the hiring manager can set up all of the requirements for the position from interviewers, salary requirements and position skills. 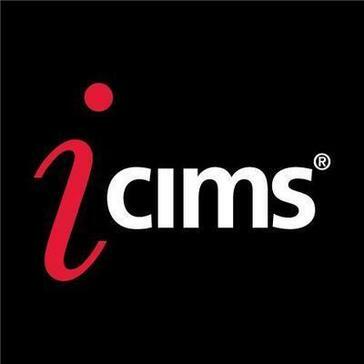 I've used iCIMS for the last nine years and it is the most comprehensive tool I've worked with. The ability to customize workflows, fields and reports makes it very handy in getting what you want out of tracking. In addition, due to it being a cloud based platform it is easy to access the system from anywhere without having to VPN in to an internal network. Adding and removing users is very easy from an administrative standpoint. The jobs library is a nice feature which lets us keep our descriptions up to date. Some features of the system are not customizable like pop-up windows. In addition, customers do not have the ability to remove fields that were created in error or are no longer used, we can only hide them. The system is very powerful so it can overwhelm inexperienced users with appearing to be too complex. Because of the complexity of the system, companies need to have you need to have a competition administrator to manage and make updates. We tried to integrate Outlook in to iCIMS but they require us to white list a huge chunk of IP addresses which our security team was not comfortable with. Recruiter tracking, source tracking and workflow management. We are able to monitor where our marketing spend is paying off based on the amount of candidates coming through from different sources and how many are hired. In 2015 we hired 681 people with a team of less than 10 Recruiters. There is no way we could do this without a good workflow management tool. "Super In-house Admin capabilities; fairly intuitive user-interface." The iCims platform allows you to configure your candidate experience and internal process in real time. No waiting; no change order fees. If you're used to other providers where configuration changes mean submitting a ticket, scope of work meetings, pricing and then execution time, this alone will make your experience. When you do need to reach out to iCims they are the most responsive customer service providers I have ever interacted with - not a statement to make lightly. Perfect? No. Close to it though: their commitment to listening to customers and incorporating feedback very quickly is simply superior. I see occasional iCims configuration changes which don't fit the way I use iCims and which are not configurable. I hope they will continue to believe that part of their tremendous appeal is the ability to customize their platform and user experience so much and so easily. Do your due diligence and speak to iCims' customers with similar structure and anticipated use. ModSpace has been able to streamline and adjust our recruiting process achieving our time to fill targets for the last 3 years. iCims' reporting functionality has enabled us to continually tweak and focus our advertising dollars resulting in reduced and more effective recruitment budget. Easy to navigate and attractive data visualizations. Makes screening effortless. Easy to displace applicants in appropriate folder. First applicant tracking system I have used and it was easy to get used to. Makes it convenient to screen a bulk of candidates. Good for high volume recruiting. Not dislike anything. I dislike that our company has not implemented this applicant tracking system earlier. Even though getting used to the program is pretty simple, at first it can seem overwhelming. The front page could be simplified and easier to navigate. Give it a try! It's easy for not only the recruiter, but also the candidates. Easy for new recruiters to start using, does not require much training. My favorite part of this system is the ease of finding applicants and sorting them into desired categories. It gets harder to navigate through candidates when you have a large amount of applicants for one position (300+). This is a great tool when you know what you are doing, if you company is planning on implementing read the manual provided and ask lots of questions to your contact. This recruiting system has helped the company steer away from all forms of paper application and move ahead in the digital age of applying for jobs. "An ATS we would recommend to all"
The platform allows for customization to fit your company's needs. Easy to filter data, pull reports into an excel sheet and track hires. Req approvals, sharing candidates with hiring managers and dispositioning is a breeze. Customer support is fantastic, whether you call their helpdesk or your account manager, everyone is very knowledgeable and friendly. The platform can be difficult to navigate through at first but once you get the hang of it it's a great ATS. We do notice there are bugs when the system goes through updates (which is usually once or twice a year), but they are fixed within a few days. Yes, this is an awesome ATS. There are some limitations to what you can do, e.g. how reports are pulled, but we've managed to find some workarounds. Having an ATS (and one that works well) is so crucial to recruiting. It keeps everyone organized and tracks everything so you have a paper trail to back you up. "Solid ATS if you have the right admin resource"
iCIMS is a solid ATS with a ton of features for both connecting with candidates, recruitment workflow and pipeline management, and onboarding. It is extremely customizable allowing you to create different access for different users, custom fields, custom forms, custom integration with other 3rd parties (e.g. HRIS, background screen providers, employment screening assessments). However, the system can be somewhat complex and there are some limitations based on the way it is configured on the backend. There is solid reporting and metrics that can be pulled as well. As mentioned, there is a level of complexity for the platform and training that is needed to fully understand the tool and all its capabilities. It can be cumbersome for some hiring managers that aren’t tech savvy. However, they have an awesome help desk line that can provide all the guidance you need. I've used several different products (jobvite, taleo, maxhire, ADP). Of all the ones I've been exposed to, iCIMS is one of the top. It also allows access for staffing vendors (e.g. onsite contingency staffing partners) which is great. We didn’t have a true ATS prior to iCIMS which we implemented a couple years ago. We used it initially to streamline our process and create a standardized process for recruitment. Since then we have used the metrics and reporting tools to allow us to gain insights in to performance and recruitment bottlenecks, as well as create tighter alignment with finance for budgeting alignment purposes. We continue to look at refining the processes we have to create high levels of automation and data tracking. The ability to do several things at one time is probably what I enjoy the most about iCIMS. I am able to send "screened out" letters to all unsuccessful applicants with one click. The option to add variables in the emails are very helpful. It allows the emails to be personalized as it customizes the job title and job location applied for and the candidates name. I don't like how we have to go to the candidate's "Person Profile" to access additional documents such as cover letters and candidate questionnaires. It is a great applicant tracking system. Contains all of the features that we were looking for! I highly recommend! We are figuring out where it is the best to post jobs on based on where we are getting most of our applicants from. Also, we are able to allow a select amount of people access the resumes and cover letters. We are also saving time on tedious tasks because iCIMS has a lot of automatic features. * We monitor all iCIMS Talent Acquisition Platform reviews to prevent fraudulent reviews and keep review quality high. We do not post reviews by company employees or direct competitors. Validated reviews require the user to submit a screenshot of the product containing their user ID, in order to verify a user is an actual user of the product. Hi there! Are you looking to implement a solution like iCIMS Talent Acquisition Platform?